The map above and the map to the right of this column shw the locations of many of the people who have read this blog in the past month. 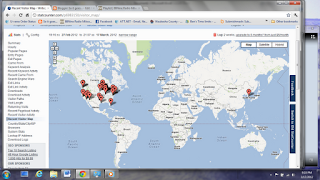 It is a cool little gadget called ClustrMaps that does an on-the-fly GeoCode of the IP addresses of people who click on my blog. I find this interesting because I'm a map geek by trade. While you can read the names of the places people have visited from using another gadget called StatCounter, it's another thing to actually see the locations on a map. That is what makes ClusterMaps so cool. For that matter, that is what makes GIS so cool. It is putting a map to the data. If you think about it, somewhere in the neighborhood of 75% of all data has a mapping component to it. Does the data have an address or location? It probably does. Where does crime happen? Where are the areas of poverty? Who voted for who? Where is a good place to eat? Where are the places to avoid eating? Where does my cell phone go dead? The list goes on and on. My blog results tells me a lot of things. The clearest trend I see is that most of my viewers are from either, Wisconsin, Minnesota, New York and California. That's where most of my family and friends are, so it makes perfect sense. It's when we get beyond the obvious that the data gets more interesting. Perhaps the most interesting statistic of all is the international hits I've had. ClustrMaps shows (and tells) that I've had hits from China and Korea. My question then is are those rogue hits that came up by accident, or do I actually have a fan in each of those countries? (If you are from there and are reading this, please leave a comment, as I'd love to hear from you.) My guess is the blog came up in a google search for some reason and the user clicked, took a peek and left, never to return. That's a guess, anyway. Some of the North American visits are interesting too. Sioux Falls, SD is one of them. Who do I know in Sioux Falls? I'm not sure, but I'm glad to see them. Same goes for Council Bluffs, Iowa. I think I was there once, but I'm not sure, it might have been Des Moines. While I think the Washington, DC hit is probably my friends Pete and Amy, I'm not sure who the Chantilly, VA person is. Again, welcome! It's especially cool to know that I've had a few hits from Washington State as well. One of them is from Issaqua, which, frankly I've never heard of, but what a cool name for a city! "I live in Issaquah," sure does have a good ring to it, eh? Donna and I have been especially intrigued with the Pacific Northwest, so its nice to know that someone out that way has visited. Along the statistic lines things are interesting as well. 3. Many of my referrals came from Keyword Searches on jim landwehr blog, but some came from marcus amphiteatre inside. Not sure of the connection, but somewhere in one of my posts must be buried a reference to the marcus. A few of them came looking for "A Home for Wayward Clocks," which references my review of Kathie Giorgio's book release. 4. While almost 50% of my visits stay for less than 5 seconds, (likely people checking to see if I've posted), 40% stay for an hour or longer. 5. 35% use Internet Explorer, 20% use Chrome and 15% use Firefox. I'm a big Chrome fan. Fast, but a wee bit buggy. All of this is cool stuff to data and map geeks like me. Most I suspect will find it hum-drum, but I beg to differ. Knowing where people are coming from helps me understand what they're looking for. And besides, it makes a great map.